Shakspeare, Ann Hitcham, Family and Commercial – comfortable house; White Lion, John Warden; Red Horse, John Gardner. 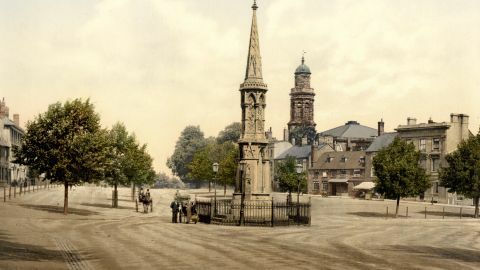 Branch of Warwick and Leamington Banking Co.; Branch of Stourbridge and Kidderminster Banking Co. This interesting part, of Warwickshire is directly accessible by a branch of the Oxford, Worcester, and Wolverhampton line, by which means it is within, about 100 miles journey by rail from London. A Roman road, called the Fossway, crossed the river at this point, and hence the name. 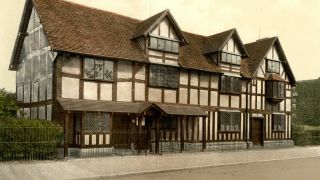 It is a municipal borough, but derives its chief importance from being the birthplace of Shakspeare, who was born here 23rd April (St. George’s day), 1564, in an old-fashioned timbered house, opposite the Falcon, in Henley Street, which, after some changes, and the risk even of being transferred as it stood to America, by a. calculating speculator, was at last purchased by the Shakspeare Club, and adopted by Government as a tribute to his memory. And to which the genius of one man has given immortality, is situated on a gentle ascent from the river Avon, in the county of Warwick. If the visitor ascends the uplands on the high road to Warwick, he will behold a panorama of remarkable richness and variety. Hill and dale in graceful undulations – luxuriant wooded parks – the winding Avon tracked by the fringe of willows on its banks – the peaceful town and its venerable church – and, afar off, tire gradually towering outline of the Malvern hills form, altogether, a landscape essentially English, and such as is rarely to be found in any other country than our own. But rich and pleasant as the prospect is, it takes its crowning glory from the immortal poet, the mighty genius whose dust reposes at our feet. It is his genial spirit which pervades and sanctifies the scene; and every spot on which the eye can rest claims some association with his life. We tread the very ground that he has trod a thousand times, and feel as he has felt. Four rooms in this house remain probably as they were in the poet’s days; and in one of them he was born. The whitewashed walls are covered with names of visitors, who also enter them in a book, or rather a work, winch now extends to several volumes. It was inhabited by the descendants of his sister Jane till 1806, and used as butcher’s shop and a public house. Many of the houses wear still an air of picturesque antiquity, especially a carved one in High Street. Here also are the Town Hall and Market House, both modem buildings. But the Guildhall, which belonged to an early religious foundation, is an ancient pile of the 15th century, used as a Free Grammar School, having an oak roof, &c. Here Shakspeare received his education – his father being a glover. The Town Hall is embellished with Shakspeare’s statue (the gift of Garrick), and contains Wilson’s portrait of him, and Gainsborough’s of Garrick, who presided at the Shakspeare Jubilee, in 1769 (the year after the hall was rebuilt). It was celebrated on the 6th and 7th September, with great rejoicing. Dr. Arne performed his oratorio of Judith at the church, and the dedication ode was recited by Garrick; after which another actor (King), in the character of a macaroni or dandy, attacked Shakspeare as “an ill-bred fellow, who made people laugh and cry as he thought proper.” On this occasion, the corporation presented Garrick with a medallion of the Poet, cut out of his mulberry tree–the famous tree under which Garrick and Macklin were entertained in 1742, by Sir Hugh Clopton, at New Place, where Shakspeare died, on his birth-day in 1616, exactly 53 years old. From the old bridge, built in the reign of Henry VIII. by Lord Mayor Clopton, there is a full view of the venerable old church, and the placid scenery by which it is surrounded. It stands close to the river by itself, on the south side of the town, at the end of an avenue of limes; and is an early Gothic edifice, lately restored by the Shakspeare Club (which meets here every 23rd of April), with a lofty octagonal spire. Entering the carved porch and oak door, you come upon a view of the spacious interior, with its stained windows, Clopton banners and escutcheons, carved stalls (for its college principals), and the great Poet’s Monument on~the west side of the chanceL It is a half figure of him, sitting as if about to write (the pen has been stolen), under a Grecian (not Gothic) niche in the wall. The bust was originally flesh-coloured, but, horrid to relate, it was painted white in 1793, at the suggestion of his deluded commentator, Malone. Some lines in English (there are also two in Latin) beginning, Stay, passenger, why goest thou so fast? contain (perhaps have been borrowed), the germ of Milton’s noble lines. The ashes of Shakspeare lie under the slab immediately below, inscribed with the well-known verse, Good friend, for Jesvs’ sake, forbeare, &c. His wife, Anne Hathaway, died in 1623; his favourite daughter, Susanna Hall, and his old friend, John à-Combe, lie near – the latter under an effigy by G. Johnson, the author of the poet’s bust. There are other monuments around, but the mind refuses to dwell on anything that is not connected with Shakspeare. His idea pervades the place; the whole pile seems but as his mausoleum. Its spire is the beacon, towering amidst the gentle landscape, to guide the literary pilgrim of every nation to his tomb. –W. Irving’s Sketch Book . 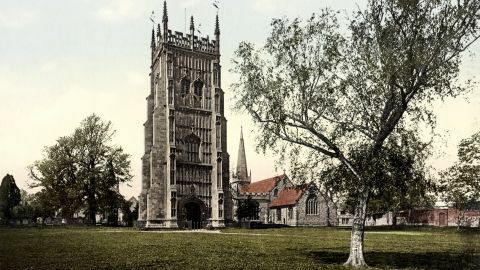 Stratford Church, and the River Avon.–Even divested of the abounding interest which association with the name of Shakspeare gives to them, there is something eminently striking and picturesque in the appearance of the church and river from the neighbouring meadows. The Avon, which from its source at Naseby wmds like a silver thread through fertile vallies and rich groves in peacefulness and beauty, at this point takes a broader sweep, and proudly swells as conscious of the tutelary genius of the spot. The church, too, here encircled by its lofty elms, mid standing on the river’s brink, has a grand and venerable aspect. The far-famed mural monument and bust are on the left of the chancel, immediately above the line of graves containing the remains of the Poet, his daughter Susanna, her husband, Dr. Hall, and in all probability, many others of the family. The bust is of the size of life, and stands fixed under an arch between two Corinthian columns of black marble. There are several inscriptions upon the tablets. Good friend for Jesvs’ sake, forbeare. And cyrst be he that moves my bones. It has been conjectured that Shakspeare’s anxiety for the repose of his bones might have arisen from there being a door immediately below his bust, which formerly gave access to the charnel house. But, whatever may have been his motive, we owe to this inscription the preservation of these sacred relics for upwards of two hundred years; and we trust the simple, but impressive denunciation, will cause them to remain undisturbed. The scenes that nurtured Shakspeare’s godlike dreams. The slab where sleeps the Monarch of the Mind. The country round Stratford is peculiarly English – gardens, orchards, green meadows, a park here and there, and gently swelling hills, – but nothing striking. At Shottery, a little on the Alcester road, is the rustic cottage in which Ann Hathaway lived, and which was inhabited by her family down to 1838; it is built in the usual way, of stone and timber, and thatched. One mile north, are Clapton House (three centuries old), and Welcombe, the seat of C. Warde, Esq., under the hills, from which there are some good prospects of the town and county. Ingon House, was Shakspeare’s at his death, having been bought by him in 1597, though built originally by the Cloptons, into whose hands it returned, by purchase from the poet’s descendants after the Restoration. In 1752 it was sold to Mr. Gathell a Lichfield clergyman, who, on account of a dispute about, the rating, pulled it down. He had already cut down the poet’s tree, to save himself the trouble of showing it to visitors. Fortunately, a cutting was planted by Garrick over the grave of Shakspeare’s favourite grand-child, Lady Barnard, in Abington churchyard (near Northampton), and another is said to be at East Cliffe (Hastings); while the remains of the desecrated tree were sold in the shape of boxes, cups, &c., by Mr. T. Sharp, of Stratford. Immediately behind was a little farm which belonged to Shakspeare’s mother. Alveston, T. Townshend, Esq., on the Avon, is near Charlecote (or Chalcot as it is called), the seat of G. Lucy, Esq., a truly old English pile, of the Elizabethan age, built of brick in 1558, by Sir Thomas Lucy, the poet’s Justice Shallow. The “Three Luces” or pikes swimming among cross cross-lets, are here conspicuous; and they are seen again in the church, winch has been lately rebuilt. Alscot Park, on the Stour, belongs to J. West, Esq. ; further up the stream is Eatington, the old seat of E. Shirley, Esq. To the west are Piping Pebworth, and Dancing Marston, as they are universally called, in some lines attributed, of course, to Shakspeare. 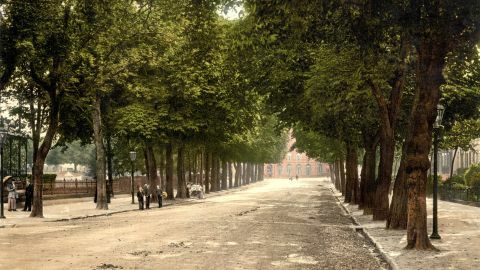 Cheltenham takes its name from the river Chelt, and is celebrated for its medicinal waters. It has been for the last sixty years one of the most elegant and fashionable watering places in England.